Hi my name is Michael, and I’m a grandpa, in the most fictional sense… Thanks to my lower back aches, and pains, traveling has never been so irritating. At the age of 25, it’s almost like watching a repeat of 15 going on 30, but this is a remake of 25 going on 50. But thanks to my years of sitting in cars, riding in airplanes, and staying in hotels, along with friends and relatives, I’ve learned the tips and tricks to get the most comfort and relief out of my travels. 3 years ago, I was in a large accident. In the middle of a soccer match, I went up high in the air to challenge for what we call a “50/50” ball. My vertical leap took me high above my opponent, and one shoulder closer. Although I won the ball, my landing took an awkward fall. As gravity brought me back down, my angle was shifted backwards, and not a second later I was left lying directly on my back. It hurt like hell! In my mind, the ride to the hospital took forever. Finally, as I was being checked on by the doctor, he told me that I had to take it easy the next few days, but that I would be prescribed painkillers, yep you guessed it…Opioids. In the end, I fractured my spine, developed degenerative discs, had two herniated discs, and sciatica. Under these circumstances, I learned to adapt, and a huge part of it was with traveling. About 80% of people across the globe will have a lower back pain at least once in their lives. 22% of these patients will endure chronic lower back pain, and sciatica. Everything, from sprains and strains, to ruptured discs, to chronic lower back pain will prevent you from taking your dream vacation with your family, for yourself, and prevent you from traveling the shortest distances. You’re just a push away from getting back into play and resuming your pain free travels. But before you know what it’ll take to get you on the road to victory, I believe we should take a second to learn what you shouldn’t do, and what to do to prevent traveling with a bad back. If there’s one way to travel poorly, it’s in a reclined seated position. From the seat in your car, the seat in a movie theater, or a flight, you don’t want your spine to bend, twist, and turn. If you recline, you’ll end up pulling a muscle, ant that could cause muscle spasms. I couldn’t travel more than 2 hours, yet I took a trip to Florida which was about a 6-hour flight. I learned the hard way. Sitting for long periods of time will put pressure on your spine, and more stress. If you must travel on a long flight, opt for business class because most airlines offer a lie down seat, where you can stretch out your back and relieve the pressure on your spine, and all the areas triggering your pain. If you carry a backpack, luggage, or your purse with you, don’t put a lot of items that are heavy. Added weight will place pressure to one side of your body, and it’ll cause your vertebrae to think much quicker. Now that you know what you shouldn’t’ do with a bad back, let’s expand on them, correct them, and add in some more delicious tips and tricks. As it was stated earlier, traveling in an economy flight can get a bit tricky. If your flight is taking you miles into the distance, do everything you can to use miles, talk to your gate agent, pay, but you don’t want your bum sitting on a coach seat. All of these body parts are a major contributor to your lower back pain. Whenever I travel, I will usually have my backpack on me, and inside are my laptop, some clothing, pencils, folders, basically anything that I can fit in there! All of this in a Jansen backup though? 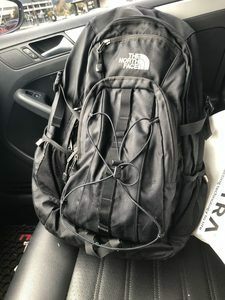 After my accident, I did a complete 180 and carried a lighter, and more structured for travel backpack to take the load off my stressed out shoulders, and reduce the impact to my lower back. You should also travel light with your luggage. Most luggage today come with built in wheels, so that reduces you from pulling or pushing. Thank god for friction! But when you go to place your luggage on top of the weight machine for check-in, the conveyor belt for inspection, the overhead bin on the plane, or on a storage rack in your hotel room, always lift with your legs. Bend at your knees, keeping your back straight, and gently raising up with your legs to lift over your head. If you need assistance, please communicate with the airline staff, hotel staff, or the surrounding people to give you a hand. If you haven’t had the privilege of riding on an airplane and had to use the pillows airlines provide for you, then let me just say, you’re not missing out. The pillows are usually made out of 100% cotton, can be a little fluffy, but they lack in padding and comfort. Have a jacket on. Take the time to have a jacket on your body already. The reason I say this is that it limits the effort of reaching into your bag, getting into your overhead bin, and potentially causing a riff in your lower back. With either a thick or light jacket(thick is the preferred choice), fold it over at least twice to get the padding just right and cushion. Place your pillow between your head and the seat. If your neck is pushed back into the seat, or if your neck is pushed far forward, re-adjust to keep your neck straight. Doing this will keep you in alignment with your spine, and your lower trunk. 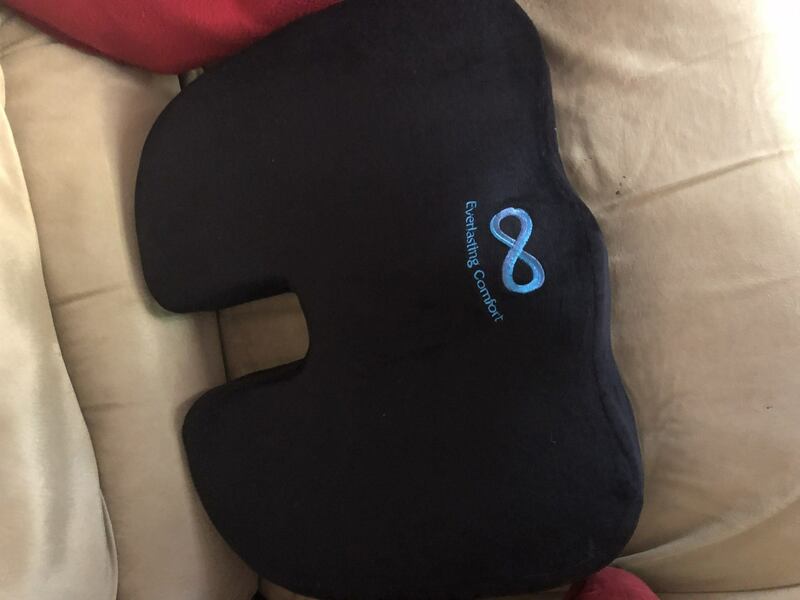 A great lumbar pillow will truly support your spine, prevents slouching, and most importantly, alleviates pressure. This all holds true especially with sciatica as a result of your bad back. Here are incredible stretches you can do before you hit your next flight, or car ride. When it comes to back pain, there’s a lot of ms interpretation on what is causing your lower back to feel the awkward pain it feels. A release ball is likely to be down your alley if you need trigger point release therapy. Why I say this is that unlike a foam roller, you’ll need an item much smaller to alleviate more centralized pain points within your tissue. With a release ball, you’ll be able to get deeper into your tissue, and take away knots more efficiently . Simply, Place it in your carry on, or in your purse for quick access. I will not lie, a foam roller has got to be one of the best inventions ever made! Like a release massage ball, foam rollers untie knots in your muscles by tearing down adhesions. If you need to cover a wide variety of areas on your back, a foam roller would be the right choice. The trick part is how bulky they are, and traveling with them can take more effort. However, if you travel with one, you will not regret it! A couple things you don’t want to intake are a high amount of carbs, and processed meals. I’m a firm believer that you should go for all the delicious meals you’re traveling destination has to offer you. When I visited Brazil, I didn’t hesitate to have 2-3 specialty made egg and bacon burgers…at a time! When you got to take a seat, make sure you keep your shoulders back, back straight, feet width apart, and your knee straight. As someone who tends to sit a lot, whether that be at work or home, after hours I will hunch over, slouch or shift to my sides. Try to limit yourself from grabbing your phone while sitting, but if you have to, stand up instead and take a walk. This exact seat cushion is with me every where I go. I’ll take it in my car for long trips, sit on it while I’m at home while working on my laptop, desktop, eating, or sitting on the couch. It’s a great addition to have if you have tailbone, otherwise known as coccyx pain. For sciatica, it takes the pressure off your nerves by pushing your spine in a straight alignment. 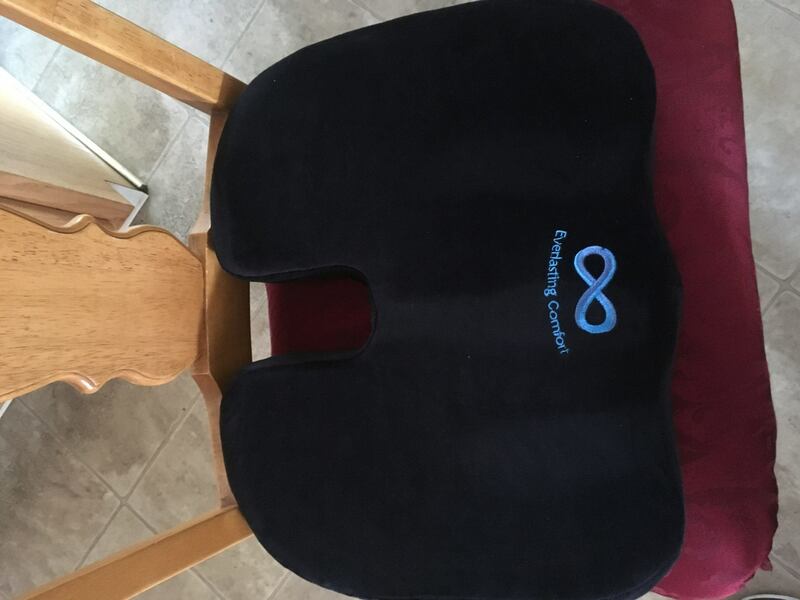 It’s helped me improve my posture at work, my driving has been smoother, and I’ve increased productivity. See my review right here. I noticed that when I travel, some hotels, homes or apartments I will end up staying at don’t have enough back support cushioning on chairs, sofas, and recliners. 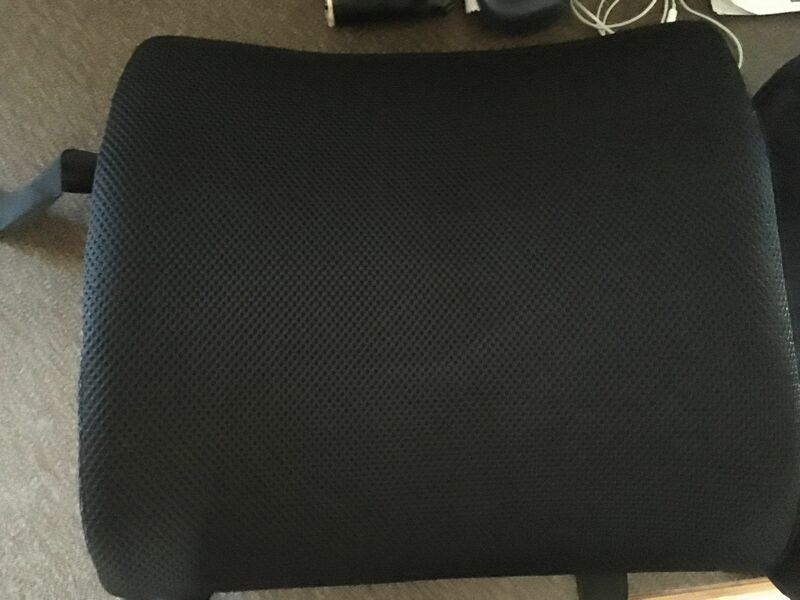 So what helps me is having the back cushion to replace an uncomfortable back rest. There are moments that I don’t hesitate to use the two at the same time. 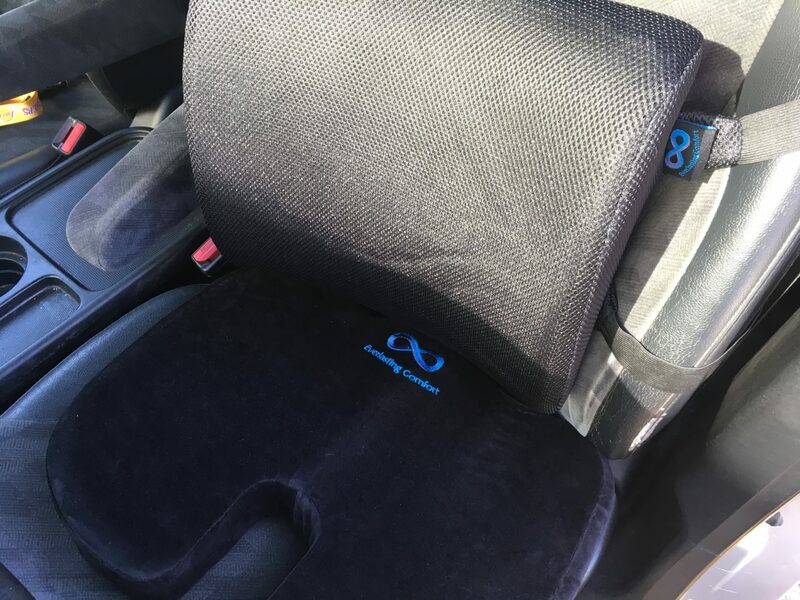 I’ll use the back cushion and seat cushion in my vehicle, and it just adds extra support for my buttocks, hips, and spine. They both are not necessarily together, but If you really need them paired, they will not let you down. I’m not one to reach for a bottle of pills that cause potential side effects, but there’s a time and a place for them. Only use them when necessary. I listed it at the very bottom because the ones above play their part much better. However, if you have just come out of surgery, or you have a more serious condition, It’s understandable. I speak for myself when I say, many of us need a quick relief, but sooner or later you end up finding out how ineffective that is. I’d rather invest my time into a long term fix then a quick one. When I travel, and I need a more natural and alternative remedy, I either stick to a certain cream and supplement together. Traveling is an ecstatic part of life. The memories to travel to places that you only get to see once in a lifetime, or places to where you love going is priceless, you can’t put a tag on a great experience. A bad back doesn’t need to weigh you down, nor does it need to prevent you from ever traveling again. You learned today how different components of your body constitute to a bad back, what you shouldn’t do when you travel, the 11 best tips and tricks for traveling, and along the way I told you a story or two. The next time you go to sit in a car, ride on an airplane, or simply just go to sit anywhere, will you have to think twice before you act? Not if you take the advice you learned today. If you need further help, have a question, concern, or you just want to offer your opinion on what helps you, just leave me a comment down below. I’ll be happy to help you as fast as I can. I love this article! having had a microdiskectomy (sp?) done many years ago, i can understand the pain that herniated discs and sciatica can bring. These are excellent ways to help with the pain when travelling. I have found relief using a small pillow and placing it behind my lower back. Is this recommended in your opinion? Thanks for a helful article! Hi aMike, first off I’m happy you found my article to be helpful for you. Yeah, that’s extreme, and herniated disc along with sciatica are two partnerships to avoid all together. They both cause too much pain to start, but once you get a strategy and plan in place throughout the day, and plan ahead of time, your body will heal, and then anything is possible. It’s just health management really. That is perfectly fine. Think of that as placing a back cushion for your chair, it’s in the same way. Yes, they are padded differently, but if you can get the most pain relief out of it without straining or hurting your back, then it’s great. Hi Tanya, its quite incredible to think how many different ways there are to find pain relief, and just how many different ways there are to make a back pain worse. But there’s so much helpful tools to help one adjust to better suit their lower back needs when traveling. I’m glad you found this post to be helpful. Thank you.